Municipalities love them. Shoppers hate them. But, sadly parking meters are here to stay and now, they’re going solar. Case in point: the Portland Bureau of Transportation has already replaced the city’s more than 7,100 single-space parking meters with multi-space, solar-powered SmartMeters. The new meters were installed in the middle of street blocks, with each meter typically serving as many as seven parking spots. Portland was one of the earliest adopters of the new SmartMeters and they can be found almost everywhere in the city. In fact, most of the paid parking spaces are currently being monitored throughout the downtown, South Waterfront and Oregon Health and Science University districts, including much of the Lloyd district. 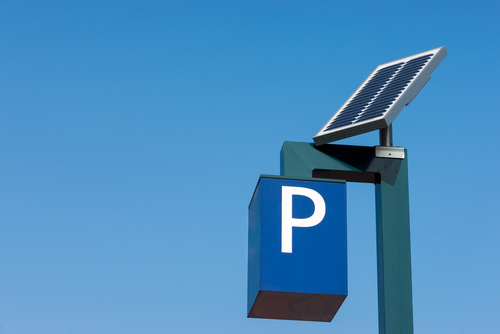 As one of the first large cities in North America to install solar powered parking meters, the city hopes to show what can be done with this advanced technology. The six-foot SmartMeters are equipped with a 10-watt solar panel that generates enough power to fully recharge the meter’s sealed lead acid batteries. Even on cloudy or rainy days, the meters’ solar panels draw enough power from ambient light. Ordinary coin-operated meters must have their 9-volt alkaline batteries replaced on a yearly basis, with batteries and maintenance adding to their cost. The new solar powered SmartMeters, on the other hand, have rechargeable batteries that typically last up to 7 years. While the city regularly recycles both types of batteries, the use of SmartMeters reduces Portland’s total battery disposal costs and the environmental impact of battery disposal. Because they feature wireless technology, SmartMeters are easier to operate and maintain than the old coin-operated meters. Portland’s old meters filled up too quickly and were often rendered out of service for long periods. These meters were also prone to jamming, all of which impacted revenue. In contrast, the new solar powered SmartMeters can instantly notify Portland’s parking administrator of any technical problems and be put to work that much sooner. The City used to deal with an average of four calls per space every year because of coin jam ups. With the new meters, maintenance calls have dropped to less than one a year. What’s more, SmartMeters can easily be upgraded and require fewer tools for servicing. The new SmartMeters give users a number of pay options. They can pay via coin, credit or debit card, or Smart cards. The meters print out a receipt that users can easily display on the vehicle’s curbside window. Meter revenues have climbed substantially since Portland installed its SmartMeters. In recent years, the meters brought in over $21 million. Portland admits that going solar isn’t the only reason for the increased revenue – the new monies have come in due to the meters now being able to take credit/debit card payments. With so many people carrying plastic, more than 80 percent of payments are cashless, which cuts down on coin collections and subsequently reduces the gas needed for collection vehicles. The cost of a typical SmartMeter runs about $7,500. Granted, that’s a lot more expensive that the $650 price tag for a single-space meter. But the advantage SmartMeters have over their not-so-smart counterparts is one of coverage: SmartMeters serve an entire block of parking spots. They also boost collection revenue and significantly cut down on maintenance costs, making them economically competitive with a string of single-space meters. The fact is Portland has encountered no major problems with SmartMeters, which could explain why a number of other major U.S. cities have adopted similar technology, including Chicago, Denver, Seattle and Washington, D.C.